Borders Steading is collection of disused farm buildings that nestles into a steep hill overlooking a valley in the Scottish Borders. 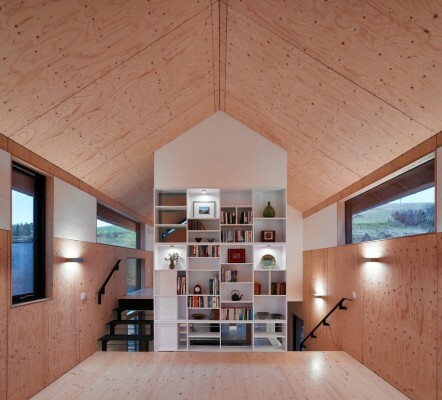 The brief was to convert the mill to create a modern, rural holiday home that retained much of its historic character. 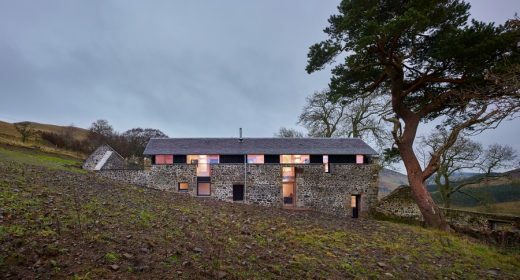 The mill’s distinctive long form emerging out of the hillside gives it a striking yet exposed position on the site and supported an architectural solution contained within the original walls. The old roof and floors were beyond repair, so a new insulated timber building was slotted into the existing structure, rising above the original wall to provide a largely glazed clerestory from where light could spill down into the lower floors. The dramatic level changes along the length of the building gave the opportunity to introduce half levels, and taller spaces, allowing light to move between the spaces and penetrate the tall cross-section of the building. The original front door is reused, entering into a boot room lined in larch. This opens on to a dining-hall with glimpses into the main living spaces beyond. Steps lead down a half level to the kitchen, which opens out to a wild garden. The main living space is half a level up from the dining-hall, with a new window overlooking the valley below. An accessible bathroom, utility and bedroom are tucked in the partially underground north end of the building. 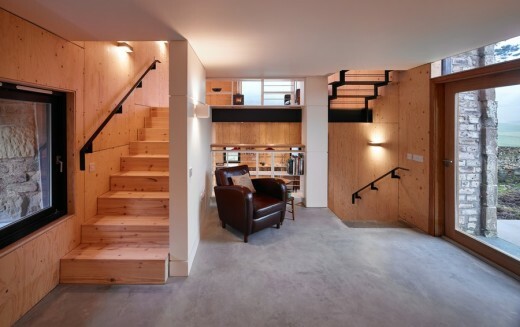 On the upper floor there are three bedrooms, two accessed from the west stair and one from the east stair, allowing a double-height space between to give light to the ground floor. The original building was characterised by its forgiving mix of rural materials showing its previous historic adaptations. The original walls were consolidated and repaired using stone from the site, and re-pointed with lime mortar. 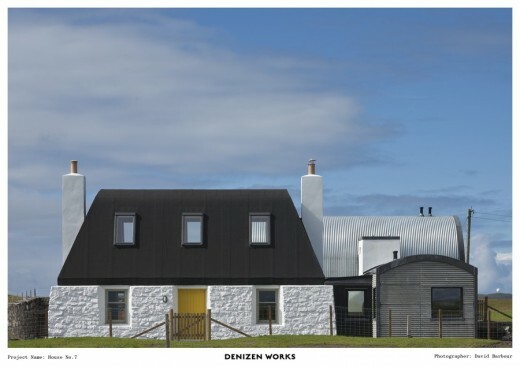 Any new openings in the stonework were edged in galvanised steel and the new timber structure clad in black stained timber as subservient to the original walls. This family house is on the edge of a clachan, a small grouping of farmsteads, on the leeward side of the stunning Mourne Mountains in County Down and is composed of two linear traditional building forms that continue the existing settlement pattern; each discrete form being displaced and slightly rotated in relation to its neighbour. 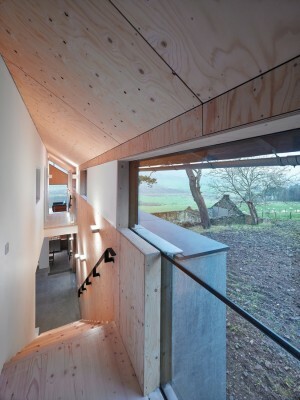 The two forms are welded together by the extension of roof slopes. 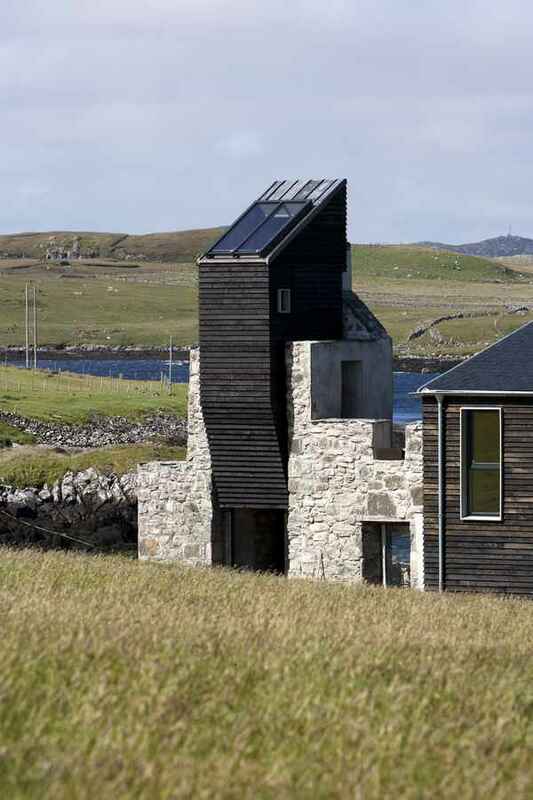 The resulting silhouette anchors the house to the ground and fixes it in the landscape. There is real talent and judgment at work here and a deftness of hand that goes far beyond a reimagined vernacular. The front entrance yard has a cool tension reminiscent of the Mexican architect Luis Barragan, albeit without the colour, and is authentic in its context and meaning. The entrance hall leads to a music room, a trapezoidal volume complete with piano, and enclosed by a pair of folding and sliding barn doors. A guest bedroom to the east occupies the end gable of the shorter building form – a wonderful cavernous volume with a large singular window and timber planks for a floor. The longer range of west-facing living rooms with serried overhead bedrooms all gaze outwards at the Mournes. 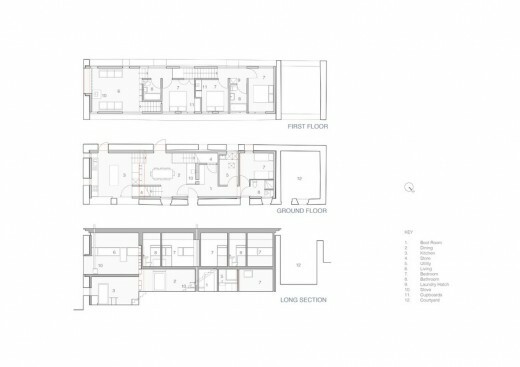 In the second living room the diagram is subverted by a tall clerestory window reaching through the first floor to scoop morning east-light into this otherwise west-facing space. This is a family house providing an empathetic framework of beautiful spaces for its occupants, opportunistically using the site and appropriate technologies to achieve an eminently habitable and sustainable home. The quality of construction is very high, exemplary and demanding detailing executed with evident local skill and obvious pride (who said craft was dead? ): a credit to architect, client and builder.